Crude oil could rise to $60 a barrel by the end of the year, even without any help from OPEC. 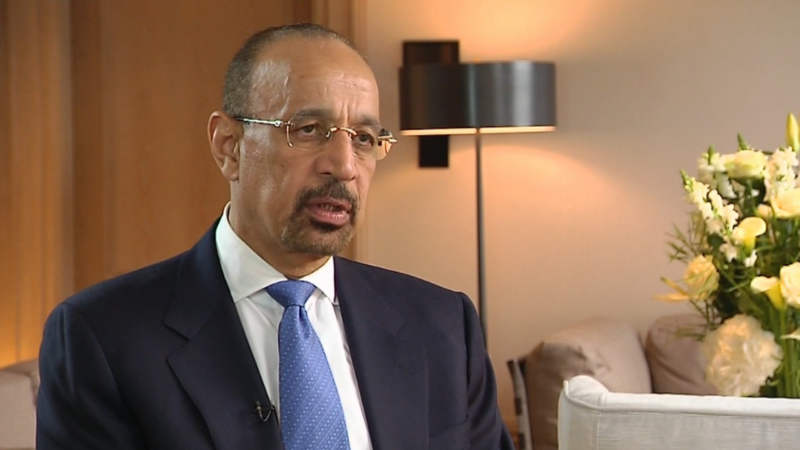 That's what powerful new Saudi energy minister Khalid Al Falih told CNNMoney's John Defterios in an exclusive interview on Thursday. Al Falih was speaking just after OPEC wrapped up a summit in Vienna. During the meeting OPEC decided against implementing a cartel-wide production quota range, once again failing to reach an agreement to cap oil production. "The right thing to do is continue to monitor the market and let the market do its thing. It's working in our favor now," Al Falih said, alluding to declines in non-OPEC production and rising oil prices. Al Falih, who replaced longtime Saudi oil minister Ali al-Naimi in May, said $60 oil by year end is "very possible" and higher prices in 2017 are also likely. He said supply and demand have "converged" and prices have been lifted by supply outages. Recent supply disruptions in Nigeria, Canada and Colombia have helped lift oil to $50 a barrel, up nearly twofold from mid-February. Related: Mystery: How much more oil can Saudi pump? Higher oil prices will be greeted by groans from many American drivers. Already, crude's big rebound has lifted gasoline prices to $2.32 a gallon, compared with $1.70 in February, according to AAA. But Al Falih warned that $50 oil is not high enough to attract the investment needed to maintain the world's aging oilfields. Longer term, the new Saudi energy minister is concerned over a potential shortage that causes a price "spike" that is "counterproductive to the long-term stability for oil." More immediately, Saudi Arabia is at odds with Iran, its longtime OPEC ally that is ramping up production to pre-sanctions levels despite ample supply. Al Falih reiterated Saudi's stance that Iran must be part of any future OPEC agreements to curb output. "If everybody freezes, Iran will freeze like everybody else," he said. But Al Falih seemed to offer a softer position than his predecessor, acknowledging that "every country has the sovereign right to manage its own oil production." He also called Iran a "key member" of OPEC and pledged Saudi Arabia will "cooperate with all" member countries. The OPEC meeting and interview came a day after Saudi Arabia announced a $3.5 billion investment in Uber. The money came from the Public Investment Fund, Saudi Arabia's main investment fund, at a time when the kingdom has announced a big diversification strategy. Al Falih said the Uber stake is "symbolic of the new thinking within the kingdom" and is "only the beginning." "Saudi Arabia is opening up," he said. --The full interview will air on CNNI's Quest Means Business at 4pm ET.